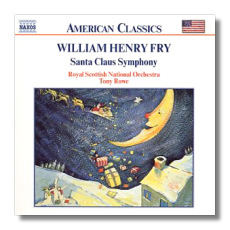 William Henry Fry (1813-1864) was the great grandfather of American Classical Music. I often wondered whence Copland got his ideas. This is it. You will also hear the roots of Ives, though that composer took things to an absurdist level. Fry also influenced Antheil. Now, for some time I have been wondering what is "American" about American Classical Music? Fry argued strongly that "American" music should be influenced by the music from our "own soil". The thing is, whenever I listen to Copland, ET. Al. I don't hear any influence from the "soil", the folk music of the era. What I do hear are references to the "popular" music of the time. Anyway, this record is certainly a keeper for my library. It is good to hear the origins of what is called "American" classical music. What is it like? Imagine Victor Herbert only better. That wouldn't be hard. Fry shows his seams, but the music is enjoyable if not memorable. The symphonies are more like a "fantasy or overture" and the two here are both programmatic. The notes included in the disc are quoted already and really helped me get a feel for the music. Santa arrived in a horse-drawn sleigh, not the now-traditional reindeer. The music utilizes the soprano saxophone, a newly invented instrument. At moments I sensed Berlioz for some reason. Macbeth doesn't sound very "American" though it has its moments of Hollywood. I slightly prefer Strauss' version. The last two items bring back more "Americana" if not direct quotes. The Niagara Symphony is really ambitious. It was written for a P. T. Barnum extravaganza but never performed. "The Breaking Heart" is an adagio with somewhat maudlin overtones. For some reason there is nowhere in the notes that indicates when this last piece was written. Okay, an enjoyable disc and it probably should be in any serious collector's cache. If for no other reason than reference, it will serve a good purpose. I am glad I had the chance to explore this music… I confess that the more I listen to it the more I enjoy it.